Gorman CA Visitors Center | Gorman Real Estate Search, Maps, Recreation, Events, Photos, Wildflower Locations, Hungry Valley Info & More! Gorman Living – Natural. Uncrowded. Pastoral. Little has changed in the tiny picturesque town of Gorman since the Ralphs family put the entire town on the market in 1994. Most the 2,900 pastoral acres remain undeveloped. 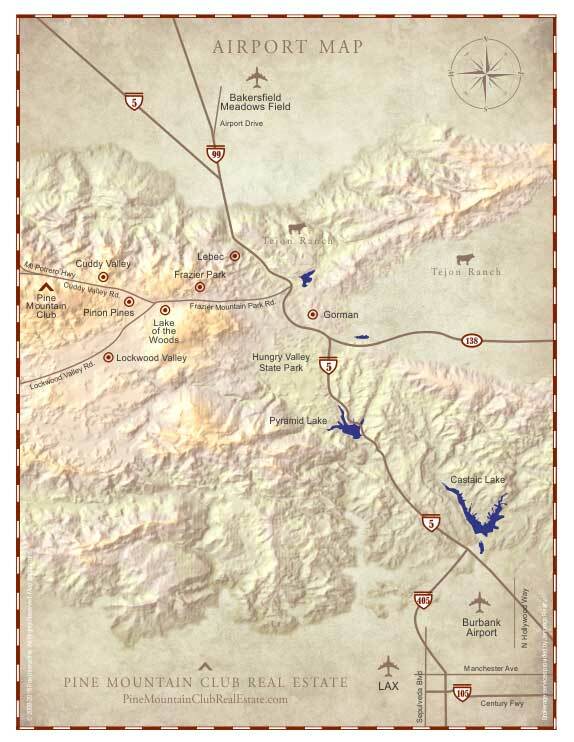 Gorman is nestled in the beautiful Grapevine Pass providing Gorman home owners with outstanding views. Gorman is still a stopping point for motorist traveling through the Grapevine Pass and visiting Hungry Valley State SVRA Park along Interstate I-5. Gorman is famous for its incredible display of California poppies, lupines, owl clover, cream cups, and other California wildflowers. Each spring, the hillsides in Gorman come alive in vibrant bursts of color – orange, purple, pink, yellow, and blue come together to create one of the best California wildflower shows in the state. For more information or a current update on Gorman wildflowers or the Gorman California Poppy display, call the following hotlines. Gorman is home to a small number of residents that enjoy the natural California landscape and wide expanses of open space. Gorman is adjacent to the magnificent Tejon Ranch, the largest ranch west of the Rocky Mountains, and surrounded by the 19,000 acre Hungry Valley State SVRA Park with its 130 miles of scenic trails for off-road vehicles. If you enjoy water sports, own a boat, or like to fish — Pyramid Lake is a just minutes south on Interstate I-5. Living in Gorman offers residents’ access to the magnificent Los Padres National Forest to explore and enjoy some of the most beautiful unspoiled land in California. Hiking, biking, ATV, and 4x4 trails are numerous in the greater mountain area and during the winter months, residents can head up to the Mt. Pinos summit for some of the best cross-country skiing in the United States. Gorman residential properties occasionally appear on the market and range in size from few acres to 20-plus acre parcels. Most Gorman homes were built between 1940 and 1960. There are approximately 14 homes in the town. If you are planning on building a home or have an interest in developing a business, undeveloped residential and commercial properties are still available in Gorman. The water in Gorman is delivered fresh from local underground mountain springs by the Golden Valley Public Municipal Water Company. The main roads in Gorman are paved and maintained by Los Angeles County while some of the residential roads are graded and graveled. There are no home owner association fees or formal covenants, conditions and restrictions (CC&Rs). Gorman is part of the unincorporated area of Los Angeles County. The residents of Gorman enjoy a four-season climate with average temperatures ranging from 86° during the day to 64° at night in the summer and 60° during the day to 38° at night in the winter. Expect mild summer temperatures with breezes during the day and a natural cooling down in the evening hours. At an elevation of 3500 feet, Gorman can receive light snow fall during the winter months a few times a year. The downtown area of Gorman offers fast-food restaurants, gas stations, a small market, and lodging. Neighboring Frazier Park offers retail shops, restaurants, markets, gas, hardware stores, a pharmacy, and the personal and professional services you would expect to find in a larger town. The close proximity to Interstate I-5 gives Gorman residents easy access to larger commerce centers in Valencia and Bakersfield. The nearby town of Lebec offers fast-food restaurants, automotive services, a nursery, gas stations, hay and feed store, and lodging. A short distance west of Gorman, you’ll find Pine Mountain Village with restaurants, a bakery, coffee house, gym, Pilate’s studio, a hardware store, a grocery and general store, gift shops and specialty stores, salons, and other personal and professional services. For a complete list of businesses, services, and organizations in surrounding mountain communities, see Local Business Directory. If you’re looking for a home or equestrian property in a beautiful area of Southern California away from the crowded urban and suburban centers with close proximity to some of the best recreational areas in California, Gorman is a great choice. 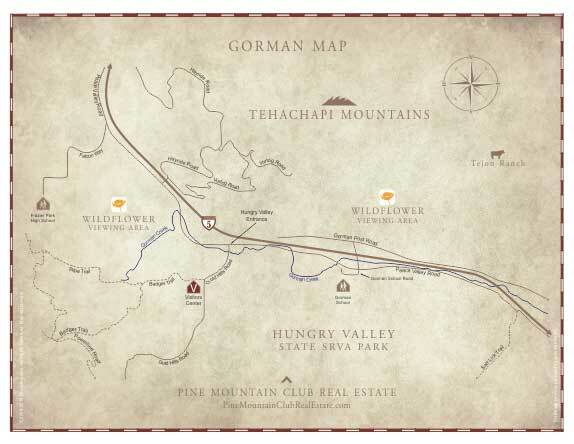 In addition to the numerous campgrounds offered by the Hungry Valley State SVRA Park, Gorman is just minutes away from many Los Padres National Forest trails for hiking, ATV, 4X4, and horseback riding. Campgrounds including Kings, Gold Hill, Dutchman, Little Mutau, and Buck Creek are just minutes away. For maps and additional information on campgrounds, hiking and ATV trails in the surrounding Los Padres National Forest, click on the following links. Gorman History – A Centuries Old Rest Stop. The settlement of Gorman is one of the oldest continuously used roadside rest stops in California. It is located in Northwest Los Angeles County just west of Antelope Valley where three mountain ranges meet: The Sierra Pelonas, Tehachapis and the San Emigdios. The native people, traveling along their ancient trail system, would have stopped there when it was the Tataviam village of “Kulshra’jek”. By the early 1700’s, the Spanish had been using the native trail for some time and called it “El Camino Viejo” – The Old Way. The first Americans in Alta California also followed the Spanish in stopping to rest and feed their horses in the beautiful mountain meadows and streams that surrounded the village now known as Gorman. Between the “Gold Rush” of the late 1840’s and early 1850’s, the founding of the Indian Reservation at the bottom of Grapevine Canyon in 1851, and the founding of Fort Tejon at the top of Grapevine Canyon in 1854, the area of the future Gorman quickly became a popular stop for freighters and travelers of the day. By the time the Reservation and Fort closed in the mid 1860’s, James Gorman had settled in the community that now bears his name. Mr. Gorman was from Ireland, as was his wife Johanna. The Gormans built a large log cabin that sat between the road and along the mountain stream running through the area. The house had rooms for travelers upstairs and a large dining room downstairs where meals were served. The first post office was established at “Gormans Station” in 1877. The Gormans sold their property to Oscar Ralphs of the “Ralphs Markets” chain in 1898. Another property owner in the area by this time was James McKenzie. His oldest daughter, Mary, married Mr. Ralphs in 1901. They lived in the Gorman family home with their nine children and established a dynasty that carried on for 100 years. In the early 1900’s James McKenzie was running the post office and store from where he would sell gasoline in cans for the many horseless carriages and motorized wagons beginning to pass by. When the road through Gorman was finally paved in 1914, the growing number of trucks and automobiles brought a good deal more traffic to Gorman Station. Gorman became a well known stop on the original “Ridge Route” where it’s Standard Oil Service Station beckoned travelers in 1923. Gorman continues to be a popular roadside rest stop for the travelers of today’s Interstate 5. A famous guest of note in 1930 was Charles Lindbergh. The Lindbergh Camp was established on the northeast side of the Gorman hills, from where he tested and flew a glider. The folded-wing Albatross was pulled to the camp behind a Studebaker sedan on a specially constructed trailer. The Bakersfield newspaper reported, "The corps of newsreel men and photographers had spent a sleepless night awaiting the famous flyer." Lindbergh had just completed his celebrated transatlantic flight the year before. Being located on the busiest highway in California, the people of Gorman knew well the need for an ambulance, as so many of the injured were brought to their homes. An ambulance service was established in 1932 with the purchase of an old Packard automobile which was converted into an emergency unit, equipped with one stretcher. The ambulance could be reached through the switchboard at the hotel and whoever was available would drive it. In the early 1990’s, the famed artist Christo displayed his work entitled “The Umbrellas, Joint Project for Japan and U.S.A.” along the Ridge Route corridor. Over 1,700 of the twenty foot high yellow umbrellas filled the mountain pass to add visual contrast to the summertime golden hills surrounding the area. Thousands of visitors came to Gorman daily that October. Gorman has served as a movie location over the last few decades. In 1991, “Thelma and Louise” was filmed in the community and if you look close during Alfred Hitchcock’s “Psycho,” you’ll see Janet Leigh pass a “Right Lane for Gorman” sign after her conversation with a highway patrolman. Based on the post office being established in 1877, Gorman celebrated the 125th anniversary of its founding in 2002. For more historical information on Gorman, visit the Ridge Route Communities Museum and Historical Society in neighboring Frazier Park or by visiting the following website. For families with children, Gorman is part of the El Tejon School District which covers a wide area including: Lebec, Frazier Park, Lake of the Woods, Lockwood Valley, Piñon Pines, Cuddy Valley, and Pine Mountain Club. School bus service is provided to Gorman. For more information on Lebec area schools and the El Tejon School District, visit the following websites. Paved main roads maintained by Los Angeles County. Residential roads are graded, graveled, and privately maintained. Water, power, phone and cable to each property. High Speed Wireless in some areas, Cable, and Satellite. Individual propane tanks on each property. From local underground springs. Municipal water company. Private Ambulance Service. Two medical clinics. One new facility in Lebec and one in downtown Frazier Park. Major medical centers in Bakersfield and Valencia. Kern County Fire Department station located in Lebec. Los Padres National Forest Fire Service located minutes away in Frazier Park and lake water on Tejon Ranch in Lebec available for extraction. Los Angeles County Sheriffs Department services the area. El Tejon School District offers Elementary through High School classes in and Lebec and Frazier Park. School bus service is provided by the district. There are many denominations in the area. See Local Directory under "Churches"
Distance—35 miles. For more information about, Valencia click the link below. Distance—45 miles. For more information about Bakersfield, click the link below. Distance—50 miles. Nonstop flights to Denver, Los Angeles, Phoenix and San Francisco and one-stop service to hundreds of domestic and international destinations. The new William M. Thomas Air Terminal at Meadows Field is now open. Visit the Meadows Field Airport Website by clicking the link below. Distance—55 miles. Nonstop flights to destinations throughout the United States. Served by most major carriers. One stop service to hundreds of international destinations. Visit the Bob Hope Website by clicking the link below. Distance—72 miles. Nonstop flights to cities all over the World. Visit the Los Angeles Airport Website by clicking the link below. Directions to Gorman – A scenic drive from any direction. From either direction on I-5, take the Gorman School Road Exit. Turn Right on Gorman School Road then turn right on Gorman Post Road or turn left on Gorman School Road and right on Peace Valley Road. To reach our office, continue north on Peace Valley Road to Frazier Mountain Park Road and turn left. Travel west on Frazier Mountain Park Road which will transition to Cuddy Valley Road. Bear right onto Mil Potrero Highway and drive 6 miles into Pine Mountain. Pine Mountain Village is on the left. You will see the Village Center sign at the corner of Mil Potrero Highway and Freeman Drive. Turn left on Freeman Drive and turn right on Pine Valley Lane into the Center. Continue on Pine Valley Lane until you see the Jennings Realty sign on the right. From either direction on the 101 Freeway, take the CA-166 exit. Take CA-166 east for approximately 70 miles. 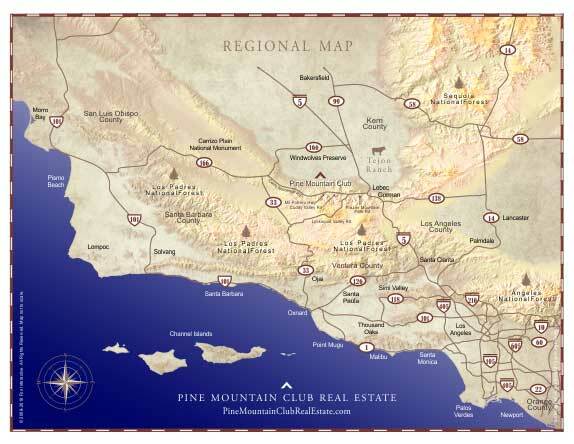 Turn right onto Cerro Noroeste Road and proceed for approximately 25 miles into Pine Mountain Club. Cerro Noroeste Road will become Mi Potrero Hwy. Continue on Mil Potrero Hwy until you reach Cuddy Valley Road. Turn left on Cuddy Valley Road. Continue on Cuddy Valley Road until it transitions into Frazier Park Road. Follow Frazier Park Road to Peace Valley Road and turn right. Travel south on Peace Valley Road to Gorman. Along the way, you can enter the Hungry Valley State SVRA Park on your right. To reach our office, follow the same directions above. When you reach the Village Center in Pine Mountain Club, continue past the Center and turn right on Freeman Drive. Turn right on Pine Valley Lane into the Center. Continue on Pine Valley Lane until you see the Jennings Realty sign on the right. Stop by the office and say hello or call me and let me know when you’ll be visiting the area. It would be my pleasure to show you the properties for sale in Gorman. Gorman Homes and Land for Sale – See every property listed in the MLS. For more information on Gorman real estate, Gorman home prices, and available Gorman homes and land for sale, follow the link below to search our listings in Gorman and the official Multiple Listing Service (MLS) that includes Gorman property listings from all local real estate offices. If you have any questions about Gorman or would like more information on a Gorman property you see during your real estate search here or anywhere on the Internet, it would be a pleasure to assist you. Bonnie Ketterl Kane. A View from The Ridge Route. Our special thanks to Bonnie Ketterl Kane and the Ridge Route Communities Museum and Historical Society for providing information on the history of this community.